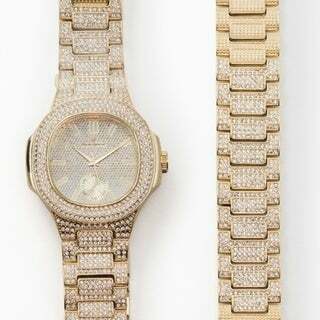 Beautiful watch with a lot of bling. I purchased this watch as a gift for my brother in law and he saw it and was floored. Very beautiful and shines like the sun but not over whelming. This user was entered into a sweepstakes after submitting their honest review. Beautiful watch with a lot of bling. I purchased this watch as a gift for my brother in law and he saw it and was floored. Very beautiful and shines like the sun but not over whelming. Looks very good .its worth the price. "Will this set turn my skin green?"